O.J. Howard races toward the end zone in the second quarter while being chased by Ronald Darby (left) and Nigel Bradham. TAMPA, Fla. — With each new wave of reporters, the question surfaced again. Each time, Malcolm Jenkins answered it without any hint of irritation. Three, four, maybe five times, as if the act was a form of penance. "I just came out with the post," he said. There was no way to ease into it. This was not a good game for the Eagles' secondary. Yes, the offense had its struggles. The injury to Jason Peters had an impact. The quarterback situation should improve dramatically if Carson Wentz does indeed return this week. But the most conspicuous aspect of the Eagles' 27-21 loss at Raymond James Stadium was the extent to which the Buccaneers' pass catchers dictated play. After it was over, you could hear the acknowledgment in the voices of the defensive backs as they confronted the reality of what had happened: four Tampa Bay players with at least 50 yards receiving, three with at least 80, two 75-yard touchdown receptions, one of them by DeSean Jackson on the first play of the game. It was that 75-yard slant-and-go by the former Eagles receiver that prompted Jenkins' series of mea culpas in the postgame locker room. The play was well-designed, with Ryan Fitzpatrick faking a handoff and turning just as Jackson broke into his slant. Jenkins bit hard on the post pattern, sprinting underneath the veteran speedster and then watching helplessly as Jackson stomped on the accelerator and left Jalen Mills receding into his rearview. Hey, these things happen sometimes: the right call, at the right moment, against the right player. More concerning was everything that happened from there. Whether it was the big bodies of Mike Evans and O.J. Howard or the speed of Jackson, the Eagles seemed incapable of keeping themselves in position to make a play on the ball in man coverage. In a one-possession game with less than three minutes left and all three timeouts, the Eagles twice allowed a Bucs receiver to work himself open underneath soft coverage for a first-down throw, the first a 17-yarder to Jackson, the second a 10-yarder to Mike Evans. Mills, the defender in the vicinity on both of those plays, had a brutal afternoon, although nobody in the secondary acquitted themselves. There was a second-quarter drive that saw a 16-yard completion to Chris Godwin, who had settled into a huge pocket in an apparent zone, and a 9-yard Fitzpatrick pitch-and-catch with Jackson on an out pattern underneath Mills. Later in the period, Fitzpatrick drove the Bucs 70 yards in 1:44 on a 20-yard pass to Howard (credit the pass), a 17-yarder to Godwin underneath Mills in the middle of the field, a couple of 9-yarders to Evans, and, finally, a 7-yard throw to a wide-open Godwin in the back of the end zone to give Tampa Bay a 20-7 lead at the half. In the third quarter, Jackson hauled in a 28-yard deep fade down the left sideline over single coverage by Ronald Darby. Ronald Darby (right) reacts after Chris Godwin catches a pass for a first down right in front of him. "Obviously, we can all look at plays in this game where we feel like if I did X, Y and Z we would have won," Jenkins said. "I can look at the first play and say, well, I basically spotted them seven points, and we lost by six. And I think everybody will have a play like that. But the good thing is, we get to play next week, and we have all the confidence in the world that we have the right guys in this room to get a win." It will be interesting to see how this defensive unit regroups after allowing Fitzpatrick to join Eli Manning and Tom Brady as the only quarterbacks to throw for 400 yards in a game against the Eagles since Jim Schwartz took over as coordinator. The one thing Fitzpatrick has in common with those two quarterbacks is a diverse, well-rounded set of receivers. In fact, credit where credit is due: It's hard to imagine that, top to bottom, there is a more talented group of pass catchers elsewhere in the NFL. "They're a versatile group," safety Rodney McLeod said. "They have everything you're looking for when it comes to the skill positions, especially at receiver. … Mike Evans is a big receiver with a catch radius who can go up and get anything. DeSean Jackson can take the top off the defense. [Godwin] inside is quick and shifty. And then O.J. Howard is a big tight end. Fitzpatrick played a good game, took advantage of his throws, took what we gave him, and made it count today." "They're a talented group," the cornerback said. "But we've got a lot more talented groups. You just gotta come prepared. It's the NFL." It's worth noting that this is the second time in the last three games, including the Super Bowl win against the Patriots, that the Eagles secondary has been the victim of a four-quarter shredding. Given what we saw over the entirety of last season, the unit has earned the benefit of the doubt. But on the list of culprits for Sunday's loss, put the DBs at the top. 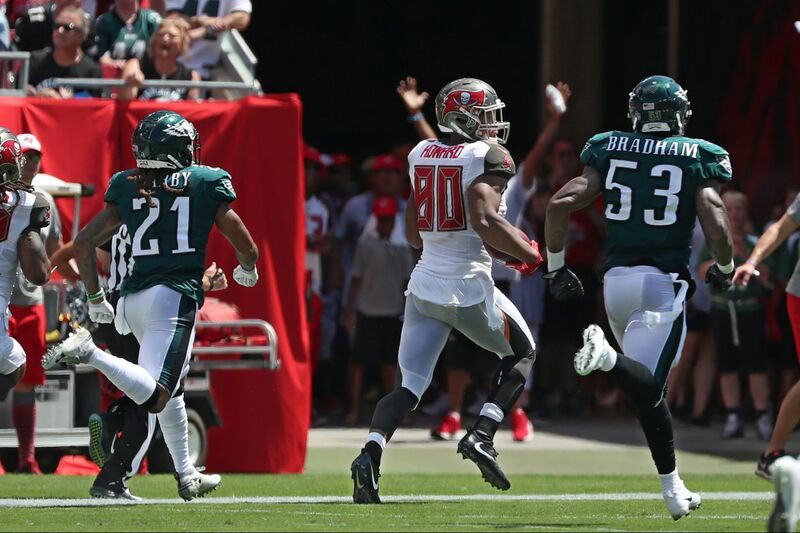 Malcolm Jenkins helps take down the Bucs’ Mike Evans during the Eagles’ loss on Sunday.